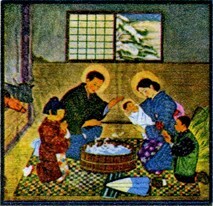 Christmas 1945, at Urakami Cathedral, Nagasaki. and now (1, 2, 3). This Nativity scene was painted for Vatican City's Christmas postage stamp issue of 1964. The artist's name is Ko(u)seki Kimiko. at John Kohji Suguiyama's site. The small (8.5 x 13 cm) print (far left) was made in the 1950s. It shows a street of Gion district, Kyoto, under winter snow. The view is toward Yasaka Pagoda, with traditional New Year motifs: pine decorations (kadomatsu) by the gate, girls in kimono playing badminton with batttledore (hagoita) and shuttlecock (hane), boys flying kites. Plus a snowman (yukidaruma). Compare a present-day view farther to the south (near left). Welcome the Year of the Dog in 2018! A pair of faithful dogs continue to keep watch on an entryway at the original Urakami Cathedral in Nagasaki. This fragment of the church is displayed in Peace Park, not too far from the present-day Immaculate Conception Cathedral (which is shown in the "Views" links above). Click on the image to view both dogs.